Family Day is coming up fast, and what better time to have a fun-filled day with your… well, family? Whether your kids are feeling some cabin fever after months of shorter days and cold weather keeping them from running around outside, or they’re happy to relax with a quiet activity at home in their pajamas, we’ve got ideas to help make sure everyone has a great day. Make the most of this opportunity for a bonding experience for your entire family using the ideas below. As a winter holiday, Family Day doesn’t exactly have a reputation as an outdoorsy day, but getting in some physical activity with your kids is a great way to scare away winter boredom. Plus, a 2018 ParticipACTION Report Card indicated that Canadian kids need to get more physical activity for healthy brain development. Hmm, fun and beneficial? Sounds like a no-brainer to us! If the weather’s right, you could head to the local park for some good old-fashioned, snow day fun: build a snowman, make snow angels, or go tobogganing! Not only will everyone burn some energy, but they’ll have great memories for years to come from that time Mom helped make a snow fort, or Dad took them down the scary hill on a sled – and it wasn’t so scary anymore. Too cold or wet? Why not try an indoor adventure, like rock climbing? You might be surprised to know that some climbing gyms have kid-specific programs! Getting to the top can be a bit of a puzzle, so your child is challenged physically and mentally (and you will be too), leaving everyone feeling accomplished and with the sense of a Family Day well spent. If your kids have been bouncing off the walls at home lately, you could head to a trampoline park, where the bouncing is encouraged. Jump around for an hour or two to improve balance and posture, and oh yeah – to have a blast! This is an activity that’s sure to put a smile on your face and have you feeling like a kid again, and it’s a great opportunity for your kids to get creative with different jumps and tricks. Maybe they can even teach you some new moves! If you’re feeling really adventurous, indoor skydiving is sure to get everyone’s hearts pumping, and some venues allow kids as young as four to participate. After some safety training, each family member can tandem “dive” over a fan under the floor with a skydiving instructor. You’ll get the thrill of flying in a much safer context! Plus, photos of your faces from the dive will be a hilarious souvenir from the day. If your family is ready for a more low-key way to spend quality time, finding some instructions to make crafts on Pinterest is a great way to bring everyone together. Spending half an hour together looking at the cool pictures and deciding on a project is a good exercise in comprise, and a craft project is a good way to use stuff you already have around the house to build a memory together. From super-creative craft ideas that can help develop little ones’ fine motor skills, to more complicated science projects for teens, the Internet is a treasure trove of ideas for tactile projects to build as a family. Following instructions and working on the same activity together allows for conversation and cooperation between family members, and this is a great time to deepen your connection with your child. It’s also a teaching moment: parents can model patience with difficult or complicated instructions, and laugh rather than getting frustrated if your craft doesn’t end up looking like the photo on Pinterest. Get ready for the summer! Family Day is the perfect opportunity for your kids to log in and choose their Muskoka Woods activities for the summer. Older kids and teens can take a couple hours to plan their schedule and talk with you about why they chose wakeboarding rather than water skiing, or how re-watching Mockingjay Part 2 made them want to try archery this year. Maybe radio broadcasting has caught their eye, and it’s made them realize they’re thinking about a future in media arts, or they know they want to be a business leader and are gonna apply for the CEO program. Whatever the case, talking about what they’ll do at camp this year is a great way for you to keep a finger on the pulse of your pre-teen or teen’s evolving interests and future goals. If your little ones are too young to make their own schedule, you can choose the activities for them and then talk to them about what they’re excited for this year. Is it their first time at camp? Help them to get excited by talking about all of the fun activities they will be doing, and how cool it will be for them to sit around the campfire at night. If they’re a returning guest, you could talk about what they liked last year, and which friends they hope to see again. Maybe they loved pickleball last year, but this year they really want to check out the high-ropes course. With over 60 activities, your child will want to try new activities in addition to their old favourites! Find a new secret family recipe. A fun – and productive! – activity for the whole family is preparing a meal or dessert together. You could find a recipe meant specifically for beginner cooks, try a more traditional menu, or even let the kids choose something on their own! Sometimes the combinations they come up with (chocolate pasta?) might sound a little too whimsical, but are actually delicious! If your child is too young to use your regular kitchen knives, you can get a kid-safe knife at a department store, or have them work on measuring and mixing while an adult or older sibling does any required chopping and peeling. Recipes that are great for all ages might include salads, casseroles and soups, which don’t require especially precise measurements or technique, and a bit of imperfection won’t ruin the dish. Older kids and teens might want to try more complicated preparations, like souffles, dumplings, or even homemade pasta. These will require more precision in measurement or in technique – but your family will be rewarded with a super-special meal that you can enjoy together! But what if the recipe doesn’t turn out? It’s an opportunity to show that sometimes things don’t work out in life, and well – you can always order pizza instead. If your foodie is aged 9 or 10 and loves prepping meals for the family (or even if they just really like eating), they might want to try our new Muskoka Chef specialty week for Venture guests. From culinary skills to cake decorating, future chefs de cuisine and food critics alike will have a blast developing their skills (and enjoying the fruits of their labour)! Now – whose turn is it to do the dishes, again? Spending a day learning together might not sound like the most exciting plan for you kids during time off from school, but hear us out – we’re not suggesting you go to a classroom for the day! There are actually a lot of skills that you can help them to acquire or improve through video games and apps. Maybe English is your second language and you want your kids to learn your mother tongue to connect with their heritage, or you’re thinking of future opportunities for your family to study or work abroad. Either way, studying a language together with your kids is a great way to connect, and there are plenty of apps out there that turn the learning experience into a game, designed specifically for kids. If your son or daughter loves video games, today might be a great day for them to teach you how to play Minecraft. Yes, really! Some video games are actually really useful educational tools, and this one is a good example of a math and science tool. Players calculate angles and distances, or numbers of blocks. Having your child teach you how to play their favourite game is an opportunity for them to reinforce what they know, by explaining it to someone else, and also a way to bond over a (newly) shared interest. Note: if your kid is a gaming aficionado, they might love our Robotics activity at camp. Working on a specially-designed puzzle together is a great opportunity to introduce computer science skills to your kids, and you might even learn to code with them! From watching free YouTube videos geared towards their age and experience level, to kits that can help them build different apps by following instructions or even a magic coding wand, there are a ton of different options and price points for your family to consider when looking at building this important life skill. Whatever you choose to do together this Family Day, we hope that you have a fun and safe bonding experience! 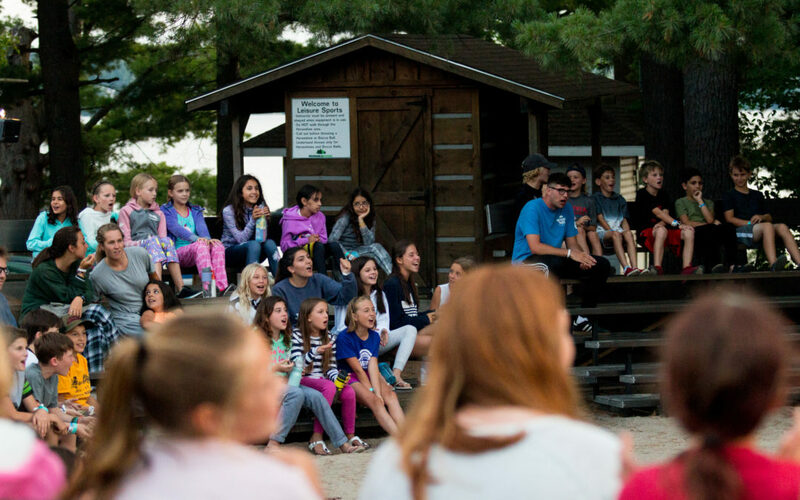 Muskoka Woods is a summer camp so excellent, you’ll want to come. An experience like no other for ages 6 to 16 on the shores of beautiful Lake Rosseau.